Where is the church office and when is it open? Centre First United Mehtodist Church's Office is located behind the Traditional Sanctuary in what used to be the church parsonage. 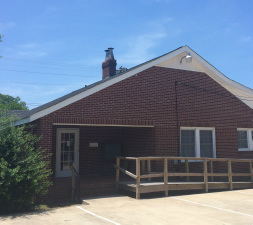 This brick home is now where our staff offices are located. Which staff persons work in the Church Office? All of our Full-Time Staff have office space in the Church Office. This includes our Church Secretary, Media Director, Youth Director, Children's Director, and Pastor. All of our church staff have a mailbox in the church office where you can leave information or a message. You are always welcome to drop by to chat, have a cup of coffee, or meet with any of our church staff, but we recommend calling ahead to make sure they are available and in the office. Ministerial work often draws the staff outside the walls of the church building! Can I meet with the pastor? Absolutely! Pastor Jeff practices an 'open door' meeting policy. This means that if his office door is open, he has time to meet with you (even if you drop by unannounced!). 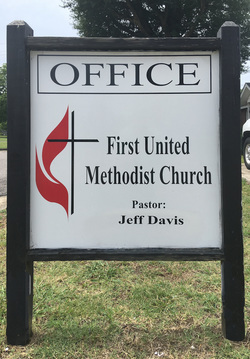 Please be aware that Pastor Jeff is often called to one of the area hospitals or meetings in Gadsden or Birmingham, so he still recommends calling ahead to make an appointment, but if you're in the neighborhood, you're welcome to drop by.